Curd Rice is a comforting South Indian rice recipe that makes for a filling complete meal with pickle. During Navratri, Daddojanam (the name Yogurt rice goes by in Andhra) is prepared as a festival food and offered to Goddess Durga. The key to a tasty curd rice lies in mashing the cooked rice lightly, fresh yogurt and the use of asafoetida in the tempering. Fresh curry leaves, coriander leaves (cilantro) and pomegranate seeds not only bring color to the Yogurt rice but also alleviate the flavor profile of this humble rice dish. 1 Mix the yogurt and salt with the cooled cooked rice. Mix well. 2 Add chopped ginger and green chilies. Mix with the curd rice. 3 Heat oil in a pan, add mustard seeds and let them splutter. Add the black gram dal, red chilies and curry leaves. Allow the dal to turn lightly red, approx a mt. Add asafoetida and turn off heat and immediately add to the curd rice. Stir the tempering into the rice and mix. Adjust salt if required. 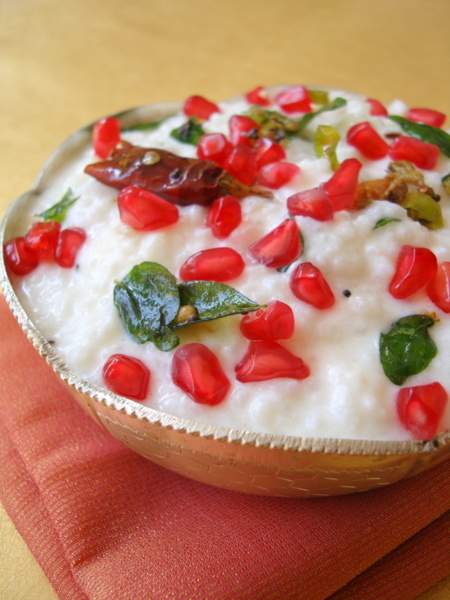 If the curd rice consistency is too thick, add a few tbsps of water or boiled milk and mix. 4 Garnish with coriander leaves and pomegranate seeds. Serve chilled or at room temperature with pickle or papad. If you have prepared the curd rice well in advance, add 1/4 cup milk to the curd rice 10 minutes before serving as milk removes any sourness of the curd. If you eat the curd rice immediately on preparation then there is no need to add milk. You can garnish with finely chopped onions or fruits of your choice like pomegrante or grapes. Beautiful pics… especially the pomegranate pearls which look like rubies..
dussera subhakanshalu Sailu, having a virtual treat with all your navratri post. 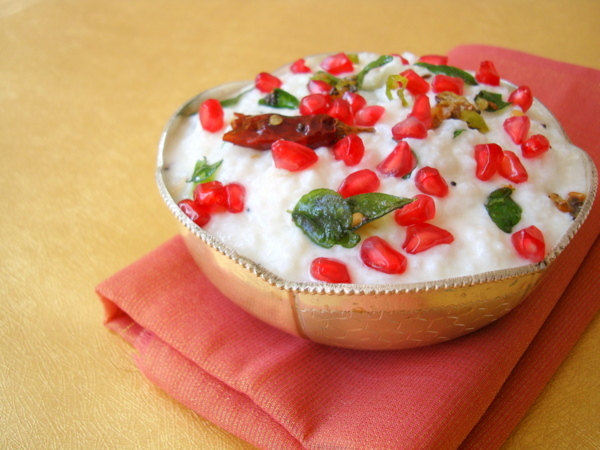 I am planning to do curd rice for a party.can you please give me some tipe how to make curd rice for around 10 cups. Usually wat happens is when i overcook rice and cool it there will be some lumps ..i am not sure why can you please give me some suggestions.